Are there references for atmospheric CO2 before 1900? in the discussion about climate change I ran into the following argument. "Historical literature speaks of basically the same amount of CO2 in the atmosphere as we have today"
Followed by a reference from a german lexica from 1890 that speaks of a mean volume percentage of 0.04% CO2 in the air. What would be your counter-argument against this? Are there any printed references as old as this one refering to lower amounts of CO2 in the atmosphere? Or is it just, that the measurements back then were just to unprecise? Re: Are there references for atmospheric CO2 before 1900? Historic literature is of very little value unless you know the experimental method and the measurement standards used. Not that you should distrust your predecessors, but there is no doubt that scientific equipment has improved with time, and we now have consistent measurements from fixed "clean" locations such as Mauna Lea that were just not considered important 100 years ago. However we do have historic samples in Antarctic ice cores. The problem with these is that they show very large and rapid variations of CO2 concentration over geological time, and also suggest that CO2 follows temperature, so cannot have been the cause of climate change in the past, so ice core data is very unpopular with politicians and climate alarmists. So increased CO2 follows increased temperatures - and increased temperatures are caused by increased CO2. The somewhat unique thing about the most recent rapid warming is that the increase in CO2 was caused by the somewhat inhumane Industrial Revolution. But the positive feedback effects are the same. So why have we not boiled to death? The graphs have been going up and down over geological time - and even in recorded history - but the "CO2 dominant forcing" model doesn't allow for down! Fortunately and uniquely for this planet, water does provide both a positive forcing and a limiting function, and the notion that temperature drives CO2 explains the apparently anomalous seasonal variation of CO2. With the evolution of mass production and an ever increasing consumer population has come a reliance upon groundwater. Called ground water because it stays underground. Like our reintroduction of fossil fuels into the atmosphere, our mass reintroduction of this ground water can't help, can it? Difficult one. Deforestation has probably reduced the evaporation of groundwater as much as agriculture has increased it, but since 75% of the planet is ocean, less than half of the land surface is cultivated, and a fir bit of the rest is under ice and snow, I doubt that the effect has been that great. thanks for the comments. I fear, they do not really help in the discussion I am having. The person is quite a conspiracy believer, sure of the fact, that media is controlled by big companies to promote their own interests, and human made climate change is an invention of sustainable companies to earn a heck load of money. That is another story and I do not want to discuss this part here now. I just want to give you a frame of what this source means for this person. He thinks, the older references (printed, to be sure it has not been fiddled around with) are more trustworthy than the newer references that take a look back into the past (and could therefore "change" it to their will). That is why I would like to focus on this old reference as well and try to interpret it as best as I can. I understand, that just dismissing this literature, that states the same CO2 values in the atmosphere as they are measured today will not benefit the discussion at all. We now claim, that the CO2 in the atmosphere before the industrial times has been around 280 ppm. How do we know that? Is that data from the Icecores? Can they be that precisely dated? Does anybody know how they measured the contents of the air back in 1800+? I found another source, that seems to state the contents of CO2 quite precisely under different conditions.It is german unfortunately (http://www.retrobibliothek.de/retrobib/seite.html?id=101252) from 1885-1892, but they compare different settings like coastal regions, desert regions, valleys and mountains and measure to the 3rd digit of volumen percent. It is thus difficult to accept a just "they did not know what they did back then" without further explanations of why those numbers are not trustworthy... at least I would not accept such an answer, if it was dismissing one of my arguments. Maybe someone has some good arguments on that... in whatever direction they go. It's an interesting paper- (Goggle's translator seems to do a good job on it). Unfortunately, since it doesn't even hint at how the measurements were made, it's not possible to say how accurate they are. My best guess is that they will have been made by drawing air through a solution of something like barium or calcium hydroxide and titrating the excess base. That's not easy to get right, not least because the CO2 in the air affects the result as you titrate. It is also susceptible to the effects of other "impurities" in the air like SO2 and NO2. Unless someone can show that the data are good, I'm afraid we have to accept that they might be bad. We simply can't rely on them and, to a degree, we might as well pretend they don't exist, because we have other ways of going about it- like ice cores. I think the ice core data is generally accepted as unequivocal and untroubled by the "corrections" introduced to more recent data. There are plenty of graphs available on the internet but http://joannenova.com.au/global-warming-2/ice-core-graph/ has been diligently expanded over a short time period to show the consistent lag between temperature and CO2. Whilst it would be difficult to put a calendar date on any ice stratum before about 1700 (when we have precise dates for major volcanic events) there can be no doubt about the sequence of events since new snow falls on top of old snow, and carbon dating gives a good order of magnitude check. The reason older data is not used is the modern experimental techniques favor the cause. If we normalized the experimental techniques, so the present has to use the techniques available to the past, with the same amount and type of equipment and manpower, the sales pitch suffers. Modern has so much more of everything ay higher accuracies that the same event appears different. For example, if we normalize the experimental technique; past and present, so we could only do ice core samples to define the CO2 for last 10 years, you may not notice any change. That technique is not good for day to day, but will averages longer term trends. With modern techniques, supercomputers and legions of investigators, you can measure temperature and CO2, by satellite, and be quite thorough over the surface of the earth. But 100 years ago you had point data at a finite number of weather stations. As an analogy, say members of our weather team were assigned a single street corner, in all major cities, counting the girls who dye their hair red. That is old school. Next, we have the modern way where we have a legion of workers, cameras mounted everywhere, that can cover 100 street corners per city, all looking for the same thing. The modern team will find many more girls so the average goes up. If the goal is to sell red headed dye products, you will market the larger modern average and downplay the lower historical one. I read somewhere that the earth had not warmed in the past 18 years even though in that time 1/3 of the manmade CO2 was added to the atmosphere. 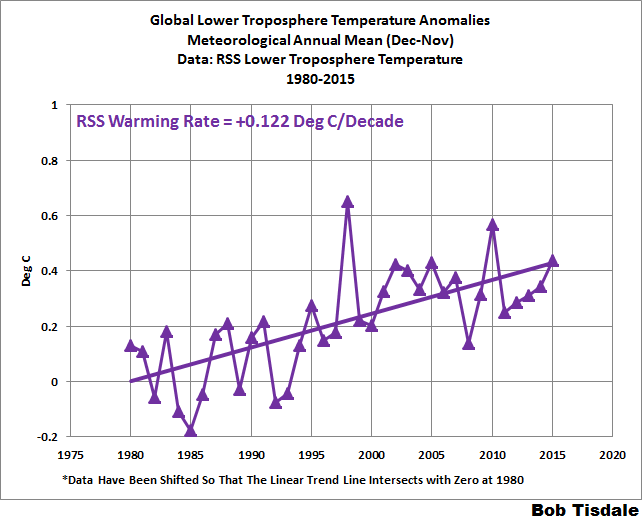 The least-squares linear-regression trend on the RSS satellite monthly global mean surface temperature anomaly dataset shows no global warming for 18 years 9 months since February 1997, though one-third of all anthropogenic forcing have occurred during the period of the Pause. This data is why it is now marketed as climate change instead of man made global warming. Car manufacturers pay for raw materials, for labour costs and for energy that goes into making a car. Ignore the first two and you have a very rough measure of the energy cost of making a car and, from that you can put an upper bound on the energy needed to make the car. Fuel is about £1.15 per litre and at 4.5 litres to the gallon the fuel used over the lifetime of the car costs about £14000. so roughly half of the cost of teh fuel can be discounted. The fuel cost is about £7000. (The VAT on cars + fuels is (I think) the same so they cancel out). The car costs about £18000, but some of that is labour and material. My best guess is that the energy used in making a car is no more than the energy used in driving it over its lifetime. There's not a great deal of difference between the two figures. Do you have a better calculation? As an analogy, say members of our weather team were assigned a single street corner, in all major cities, counting the girls who dye their hair red. That is old school. Next, we have the modern way where we have a legion of workers, cameras mounted everywhere, that can cover 100 street corners per city, all looking for the same thing. The modern team will find many more girls so the average goes up. Why would the average go up? It would get closer to the population mean, but that might lead to it falling. The "few people on a street corner" might happen to be on a street where a couple of red-headed families live, and so they might get an overestimate of the true incidence. Unfortunately you are ignoring the weight of the elephant! Raw materials cost nothing - iron oxide, alumina, copper oxide, lead oxide, crude oil....it's all there in the ground, but useless. The cost of "raw" materials for manufacturing is principally the energy cost of extracting, refining, pre-forming and transporting them to the point of final forming and assembly. I haven't chased all the figures but "raw" aluminum strip costs 30,000 kWh per ton - about 4,000 liters of diesel fuel. Steel is about half that energy cost. Once a production line is established (at whatever energy cost....) the human labor content of a small car is about 2 hours, so I'll allow you to ignore that! Being a sensible, careful driver, you will probably get 150,000 miles out of your VW Golf but the average car is scrapped at 100,000 miles in the UK, and a fair number are written off by damage long before that. The dating of the ice cores does not need to be extremely accurate. The identified mechanisms for recycling CO2 suggest a half-life in the atmosphere of about 100 years, before it is absorbed by a tree, dissolves in the ocean or dissolves a seashell or reacts chemically with a rock. So the levels will change fairly slowly. I agree that the accuracy of carbon dating is good enough to give good dates for the CO2 trapped in ice cores. A few years ago, I visited the ANSTO laboratory where they do high-precision carbon dating of ice cores - effectively counting every individual carbon atom in a sample, and deciding if it is carbon-12, 13 or 14. The big human contribution is an exponential growth in CO2 since the industrial revolution (about 2 centuries). But this has only become big enough to stand out above natural variability since around 1900. There was probably a previous human change to climate with the spread of agriculture after the last ice age. But this was more gradual (spread over 10s of centuries), we don't have such an accurate historical record of the spread of agriculture, and it is hard to disentangle human-caused changes from natural changes at the end of the ice age. If most of the raw material cost is energy and the energy needed for Aluminium is twice that of steel, how come steel is $300 per tonne and Aluminium is $2200 per tonne? With uncertainties like that I still say the best claim you can make is that the production and use are roughly the same. At any rate, it's close enough that there's no need to derail the thread about it. I also don't remember ever hearing anyone say "I'm buying a new car because it will save the world." They do it because the old one breaks. The Vostok ice cores go back 450,000 years - around 10 ice ages and well before humans left Africa, let alone started mucking up the rest of the planet! I'm not too worried about derailing the thread because I think we have pretty much answered the original question with a simple "no - apart from ice cores", but I find this diversion very important. http://www-materials.eng.cam.ac.uk/mpsite/interactive_charts/energy-cost/basic.html gives some good graphical data on the energy costs and financial cost of various materials. It turns out that my original guesstimate wasn't far off regarding steel (and other basic engineering metals) versus aluminum, but I think the variation in market price has a lot of other factors, plus the "effective" energy cost of steel may be lowered by the substantial amount of recycling (there being umpteen megatons of scrap ships, cars and trains already collected over two centuries) and volume production, compared with Al which I think is mostly new product supplied in much smaller quantities and to a tighter specification. But the car scrappage question is indeed relevant. A few years ago the UK government offered significant scrappage funding way above market value for any old wreck you could drive to the garage to buy a new car, ostensibly for "green" reasons, but as with many so-called green policies, it had no scientific basis - the real objective was to stimulate production and growth in manufacturing. I was reminded of this a couple of weeks ago when a local dealer offered over £4000 off any new car as part-exchange for an old crate with a book value of £600. Generosity or desperation? Certainly not driven by any concern for the welfare of the planet or diminshing resources! This is only one of many aspects to the discussion of climate change. Another historical question is how to track temperatures, world-wide. - One of the ways this is done is to look at Oxygen isotope ratios in limestone deposits. Looking for precedents for climate change means looking for rapid changes in CO2 or rapid changes in temperature, and any correlation between them. - The atmosphere is fairly well mixed, so you could assume that ice core CO2 levels are fairly representative of worldwide CO2 injection (averaged over the past 100 years or so). Especially if you can correlate measures in widely separated locations, eg northern & southern hemispheres. - However, the uptake of Oxygen isotopes in seashells is a very local measure, which varies on a year-to-year basis. It's harder to generate a world-wide average. Once something is dependent on more than 2 variables, most people's eyes glaze over, and they just trust that their favorite politician (or CEO's bonus) has the answer. It is an important question, but it's not simple. By all means, understand as much as you can, and be aware of the limits in the data. In the end, you have to trust the experts about what is happening, and then let that dictate the political decisions you make. If measermnent were provided right after Krakotao erruption 1883 - CO_2 level was really increased. Will hydrogen-powered cars deplete atmospheric oxygen? Why does atmospheric carbon dioxide concentration vary seasonally? What happened to atmospheric carbon dioxide after the oxygen catastrophe?